Distance : 49.7 miles (80 km) approx. 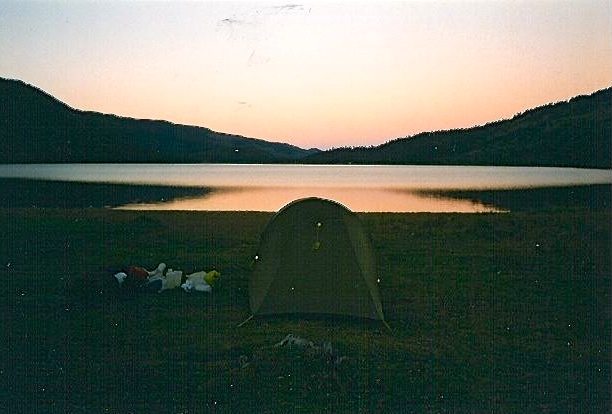 When I did this trek in 1997 there was no public transport available to either trailhead. According to Footprint Handbooks, this was still the case in 2007. Fortunately, hitchhiking from Zapala or Junin de los Andes is relatively easy. A basic route description and an even more basic sketch map can be found in Bradt publications, Backpacking in Chile & Argentina (1994). I found this to be sufficient for navigation purposes……….but only just. The trekking notes are quite detailed. They refer to the route as a Hike in the Northern Lakes. Three topo maps from the Argentine IGM 1:100,000 series cover the route: #3972-29 Quillen; #3972-23 Lago Norquinco, &; #3972-17 Lago Alumine. Click here to purchase online. For up-to-date information on Lanin National Park, contact the information offices in Junin de los Andes or San Martin de los Andes or alternatively see the Argentinian National Parks website. I would definitely recommend checking in with the Guardaparque (Park Ranger) at Quillen before setting out. Chances are he will have good maps on hand (if you haven’t already obtained them). If you ask nicely, he may even let you take a digital photo of them. You may as well hit him up for a glass of wine while you’re at it! Seriously, I found the Park Rangers in Patagonia to be uniformly helpful. Collectively one of the most chilled groups of people you are ever likely to meet. Buy all your supplies in Zapala or Junin de los Andes. 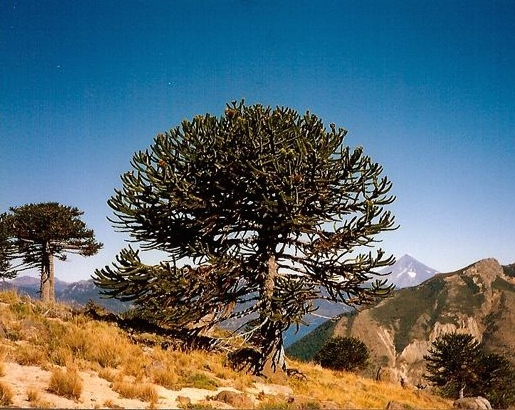 This walk represents one of your best opportunities to hike through Araucaria araucana forests. Native to this part of Patagonia, these hardy conifers are popularly known as Monkey Puzzle trees, and were so named because it was thought that even a monkey would be puzzled as to how to climb their sharp, umbrella-shaped branches. As described in the Bradt Guide, the Northern Lakes route begins by climbing steeply north from the shores of Lago Quillen. After a couple of hours the trail levels out, at which point you are afforded fine views of Volcan Lanin to the SW.
From this high point until a few kilometres before Lago Rucachoroi, the trail is often indistinct and difficult to follow. Keep map and compass in hand. Along the way you will pass a distinctive collection of granite rocks, which the Bradt Guide describes as being somewhat similar to the Giant’s Causeway in Ireland. A bit of a stretch, but nonetheless a very distinctive landmark, which will provide you with confirmation that all is well navigationally-speaking. 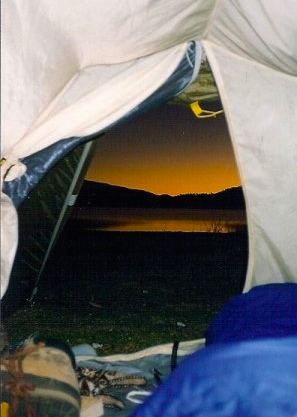 There is good camping at both Rucachoroi and Norquinco lakes. All water taken from the lakes should be treated. I found water from other sources to be fine to drink as is. Ask the Guardaparque at Lago Quillen for current information regarding water quality. On the final stretch between Lago Norquinco to Moquehue you are walking along a little used dirt road. The scenery isn’t as impressive as the previous sections. If there is any traffic going in your direction, try hitching. Solitude, beautiful lakes and forests of Monkey puzzle trees. Fantastic swimming opportunities in the lakes. Perfect way to finish a long day on the trail. The only negative was the final dirt road walk between Norquinco and Moquehue. Not a single car passed by in close to 5 hours.